Several months back, I tried to get a Phat Fiber Box, but I was little slow on the mouse, and even though I saw the listing go up, I wasn’t able to get one for myself. Last weekend, I tried again, and, this time, I got it. What’s a Phat Fiber Box, you ask? 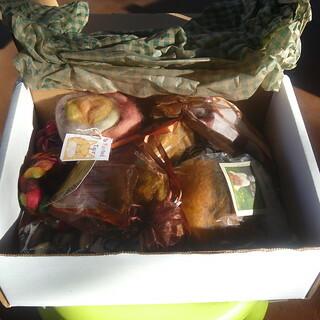 The quick description is that it’s a box full of fiber, yarn, and notions samples. (The longer explanation can be found on the Phat Fiber site.) Every box contains a different assortment of contributions, and you can choose whether you want a box with spinning fiber samples with no finished yarn, a box with finished yarn samples and no spinning fiber, or the classic mixed box. It’s a great chance to try out new-to-you vendors so you can blow more money on Etsy find fabulous fiber arts folks. Every month has a different theme, and November 2012 is “Harvest Festival”. I went for the classic mixed box. I let my daily spindle practice slide long ago, and I’d like to get back in the habit. The box arrived on Wednesday, and it did not disappoint. 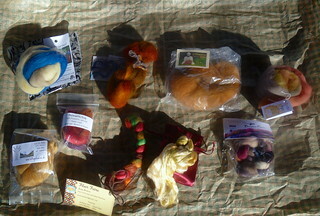 The samples fall into three categories: spinning fluff, yarn, and goodies. 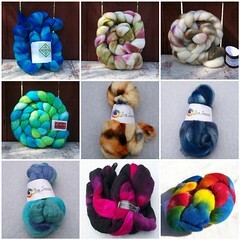 First, the fluff, clockwise from top left: Inspiration Fibers, Fiber Fancy, Giffordables, The Painted Tiger, BeesyBee Fibers, Wonderland Fiber, Fiber Faire, Huckleberry Knits, and HilltopCloud. Click through for Flickr notes! 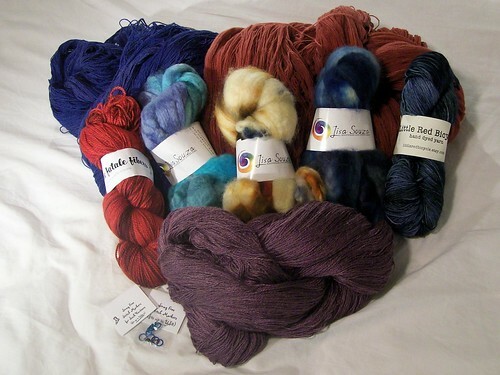 Then, the yarn, clockwise from top left: Lady Dye Fiber Arts, StimpyLab, R.A.D. 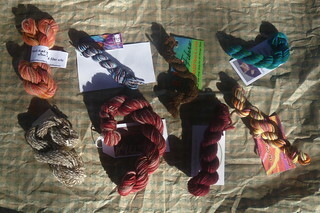 Fibers, Little Alice’s Yarn Stash, The One String, Wandering Wool, Sheep Dreamery, and Plum Crazy Ranch and Fiber Art. And the goodies, clockwise from left: GloriaPatre, The Contented Knitter, Cofanetto, and R.A.D. Fibers, plus cards from Phatties not in my assortment. It’s a great assortment. Now, to go add some shops to my bookmarks start trying out these samples! Fear not, my yarn-wrangling friends, Points West has not been given entirely over to the running. (Actually, I haven’t run since Halloween. Since I’m registered for another half-marathon in late February, this is less than ideal.) It’s just that all the knitting I’ve been doing lately has been unbloggable. But you can now see two of those recent projects in the latest Knit Picks catalog: the Inferno socks and the Burst socks, both patterns available as IDP selections. Have I mentioned how much I enjoy doing those catalog samples? I get to try out different yarn lines and new patterns, and I don’t have to figure out what to do with the finished object. And I get paid for knitting. It’s kind of awesome. 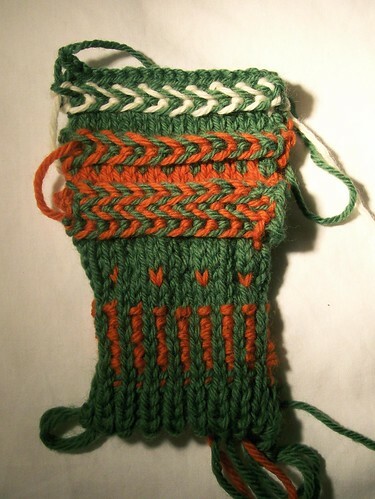 When I haven’t been knitting up catalog samples, I’ve been frantically working on K’s poor neglected Christmas stocking. Yes, the one that should have been done for last Christmas. 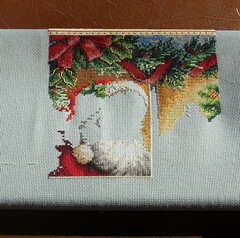 If I want it to be done for this Christmas, I absolutely have to finish the stitching by early December, so I can hand it off to K’s co-worker, who has graciously done the sewing-together part of the two previous stockings for me, and get it back before their Winter Vacation starts. I realized recently that in the entire chart, there are no blank squares. Every single little square on the front of that stocking has some sort of stitch in it. While I’ve been cross-stitching and knitting up projects that come with their own yarn, my stash has been mysteriously multiplying. I accidentally caught two Wollmeise updates over at the Loopy Ewe (twitter can be a dangerous thing, my friends). I kept the yarn out on my desk for a while, just so I could admire it. And then I decided to clean my desk. When I went to put away the yarn, I discovered that the stash bins were completely full. I honestly have no idea when that happened. And yet, yarn keeps arriving. Saturday, I came home from the CLC Fall Gala (which was fabulous) to find a package waiting for me. 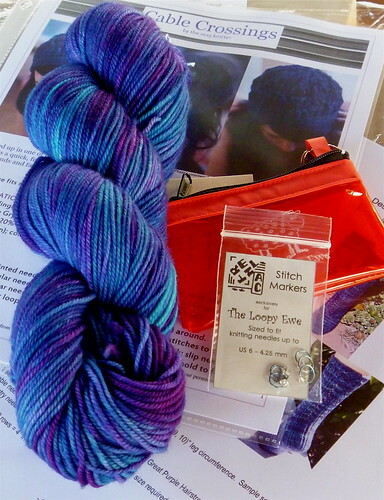 It was the final TLE Club shipment for 2010, a package I had been awaiting since getting a spoiler about it on Ravelry during last year’s club. I knew the blue Bugga! was coming – that was the spoiler I saw, and it was what sealed my decision to go for the second year option in the Club. I didn’t know about the Entrelac stitch markers. I love Entrelac stitch markers. I bought some directly from her site early last year, and I use them all the time. Also, I am utterly torn between the cabled hat and the lacy socks. You know, since the yarn bins are full, I think I might just have to wind up this yarn and make something out of it right away. I know, you’re very sad for me. Leave a comment on New Yarn! Little bitty skeins of yarn from the Impatient Knitter 4.0 swap. I love that one person put a label on. I wish I’d done that. 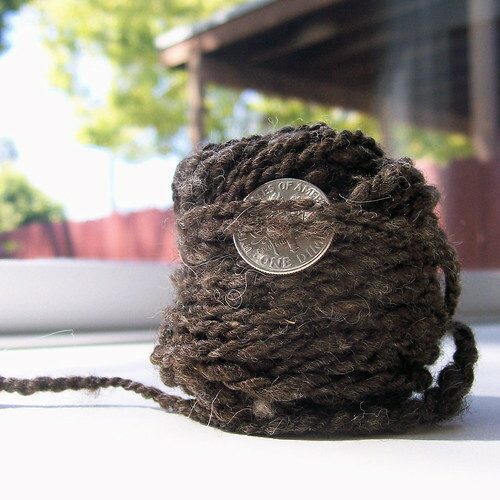 Somewhere out there are two knitters with tiny little 5-ounce skeinlets of Wollmeise who don’t even know it. I’m pretty sure that the blue/white/silver skeinlet at the bottom right is one of mine – Yarn Pirate merino/tencel in “Icicle”. See? Without labels, I’m not even positive which one was from my own submissions! 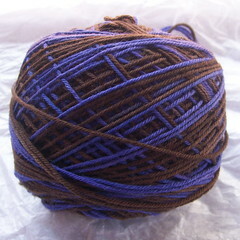 It’s about 10 yards, worsted to bulky weight, 2-ply Coopworth from that class I took at Stitches West. I’m not sure what I’m going to do with it, though. Maybe a scarf for Lil Miss’ Addy doll. We didn’t really cover finishing the yarn in class. (I’m sure it’s in the notes packet we got.) I soaked it in cold water, and now I’ve read that you’re supposed to dunk it in hot water to set the twist. Spinners out there: Do I need to soak it again? I am finding spinning very satisfying (when it isn’t making me want to throw my spindle across the room in frustration). This is good, since I already seem to be building up a nice stash of roving. And I keep “window shopping” on etsy. Next thing you know, there’ll be a spinning wheel in my den. And possibly a sheep in my yard. At least then we wouldn’t have to worry about mowing the lawn, I guess. After collapsing on the hotel bed Friday night, I was up bright and early Saturday morning. I finally got that run in, and did a few rounds on a sock before venturing out. I found my way to a Starbucks not far from the hotel. Freshly caffeinated, I was ready to tackle the Convention Center. I made my way to a nearly-full classroom for Sandi Rosner’s “Beyond the Rectangle”, a class on various shapings for shawls. My new favorite is the U-shaped shawl. And we made teeny-tiny Barbie-sized shawls to practice the increases. The round one uses pinwheel-style YOs. I got a little overly creative with the bind-off. During class, I got a call from home. “Our tax refund came, so if you want to spend a little extra in the Market, go for it!” So, I went in search of an ATM, then back to the Market for a few more goodies. 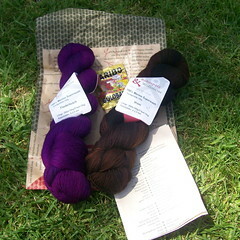 I had already spent my Market budget before picking up the Knitmore Girls swag bag on Friday. In the bag was a coupon for $5 off at Abstract Fiber Arts. So, I headed straight to Abstract’s booth for a skein of their gorgeous Hepburn laceweight and some Targhee roving. I nabbed the purple button from the Button Lady – it’s for my Greenjeans sweater. 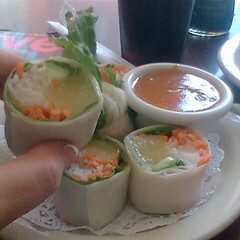 After wandering the Market, it was time for my afternoon class (so much for lunch! ), so I dashed off to a classroom over in the hotel… only to discover that the class had been moved. To a ballroom near the Market. I grabbed a seat. This was the spinning class with Merike Saarniit, and it was every bit as fantastic as I had hoped, despite my frustration with my attempts at spinning. After class, I meandered through the Market again, tried spinning on a wheel at the Serendipity Spinners’ booth, and wandered outside, where I ran into one of the people who had been in the spinning class with me. She was waiting for a hotel shuttle that seemed like it was never going to arrive. It turned out that she was staying at the same hotel I was, so I gave her a ride back. We met up with some friends of hers and another Stitches Singleton they’d picked up along the way and went out for dinner. And then, all too soon, it was Sunday. Time to pack up my goodies, check out, and head to my last class. It was Suitable Seams, the only class I’d had homework for. 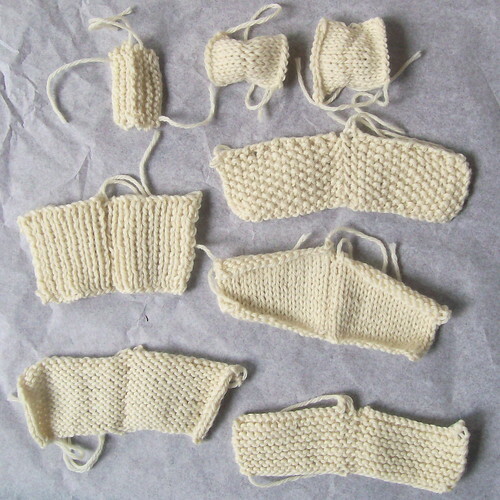 Judy Pascale showed us step-by-step how to seam stockinette, garter, ribbing, live stitches, bound-off stitches…. She also showed us a way to get that first stitch on the needle without a slip knot, making a nicer start to the cast-on row. After class, it was time for me to head on home. I popped a CD of Neil Gaiman’s Odd and the Frost Giants in and hit the freeway. Despite the traffic, I was home in time for a slightly late supper and to tuck Little Miss into bed. Overall, I had a fantastic time at Stitches West. Can I register for next year yet? Here was the plan: Wake up at 4:00 AM. Hit the road by 5:00. Reach Santa Clara Convention Center by 11:30. Get badge from the registration desk, ogle the pretty yarn in the Market, pop by Abstract’s booth for the Knitmore Girls Meet ‘n’ Greet, have lunch, enjoy first class, check in at hotel, hit the treadmill, have dinner, and go to bed. I woke up at 3:00 AM. I considered going back to sleep, but I knew that I would just be groggy an hour later. So, I got up. I was in the car and on the road just before 4:00. It’s strange out there on the freeway at that hour. It was pretty much me and the truckers. And, since it was cloudy, it was very, very, very dark. After two episodes of CogKnitive, one episode of Here’s to Ewe!, and four and a half episodes of the Knitmore Girls, I arrived at the Convention Center around 9:30. There was a crazy line for the Market Ticket booth. I found my way up to the registration table, where they inexplicably had one person working. One extremely patient person, I must say. I got my badge and headed back to the exhibit hall, arriving just a few minutes before the 10:00 opening. And then I spent all my money. I set myself a budget for the Market. I took it out in cash. When the cash was gone, I would be done. It took all of about an hour and a half. 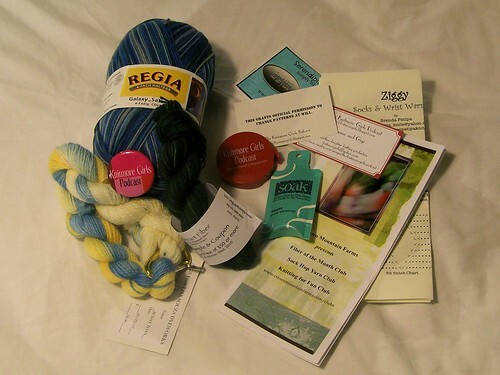 I browsed Blue Moon Fiber Arts, but didn’t find anything I absolutely had to have right away. I still have a $50 credit with them, which I’ll be using on the website sometime soon. Next stop was Lisa Souza‘s booth. Two skeins of laceweight (2520 yards per skein, people. And fantastic colors.) and three bumps of roving hopped into my bag. Now I just need to learn to spin those. I poked around quite a bit, getting turned around regularly. I eventually found my way to the booth shared by Little Red Bicycle and Femme Fatale Fibers. Really great colorways from both of those ladies! 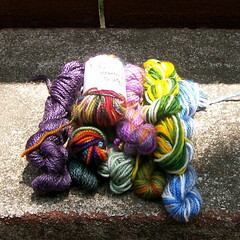 I picked up one skein of sock yarn from each, plus two packets of stitch markers from Lizard Toes. And then I stumbled into the Skaska Designs booth, where a skein of amethyst-colored merino/silk laceweight demanded to go home with me. I think it might grow up to be a Faux Russian Stole, or maybe Olga’s Indiski Shawl. And that was that. I had spent all my cash except for $8, and tomorrow’s spinning class has a $7 fee for materials. So, I headed for a table to eat my lunch… and discovered that I had left my canned chicken salad and crackers in my car. Whoops. I rested for a bit, then heard a familiar voice behind me asking, “Where’s my mother?” A glimpse of fuchsia curls, and I knew it was Jasmine. I got to meet Jasmine and Gigi, who are just as adorable in person as they sound on their podcast, and they were giving out goodie bags! I can’t speak for anyone else, of course, but they couldn’t have picked better colors in that Regia for me if they’d tried. Check out those Latvian braids! Candace is a highly energetic, spirited, fun teacher, and class was a blast. I’m going to have to try that Channel Island cast-on for a pair of cuff-down socks sometime. After class, I headed for the car and found my way to the hotel. Despite sending me a reservation confirmation email last week, they had lost my reservation. But they had a room open, and I had the print-out of my original reservation, which gave the room rate. Since the convention center’s Internet is not free, I was off-line all day, but my hotel has free wifi for guests, so I’ve been catching up on Facebook and Twitter and blogs (and finishing that episode of Knitmore Girls). Tomorrow is another full day, but at least I’m not planning for it to start at 3:00 AM. Leave a comment on But is it a Sport? My mother-in-law (who lives with us and cares for Little Miss during the day) announced yesterday that in 20 years, we should expect to see Little Miss on the US Olympic Curling Team, because they’ve been watching so much of it during the day, while K and I are at work. This fed into an ongoing discussion of whether curling is a sport. If a woman who is five months pregnant can still compete at something, is that something a sport? This led to other activities that could arguably be considered “not sports”: bowling, horseback riding, car racing, etc. “No,” said K, without a moment’s hesitation. I made it to Unwind yesterday afternoon. It turns out that they weren’t closed on Thursday – the fellow who cleans the windows had turned the sign around, and I just didn’t push hard enough on the door. 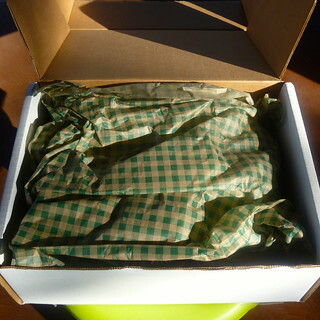 But it worked out well, since the size US7 circ I bought had just arrived in the meantime. In fact, I got to pluck it right out of the shipping box. I bought some Merino VIII as well, because I’ve added the Olympic Reindeer Hat to my Olympic ambitions this year. I’m not sure where I think I’m going to find all this extra time. I leave for Stitches West in about five and a half days now, I’m still working on my homework swatches for my Suitable Seams class, I’ve just managed to get a couple repeats of the cable/rib pattern on the body of Mr. Greenjeans done, I’m working on a test knit of a sock for Chrissy Gardiner’s next book (oh, yes, it’s coming, and it will be even better than Toe-Up!, I tell you), I have a book to read for my monthly book club, and, y’know, I have this full-time job. Still, before I leave for 3 days of knitterly festivities, it would be nice to at least leave K with an Olympic hat to keep her head warm all weekend. My Conference Schedule – a masterpiece of planning that involved the official Event Planner, my datebook, a bunch of printed e-mails, and an Excel spreadsheet – got all messed up quite quickly. A program I’d been looking forward to on Saturday afternoon was canceled, leaving me with a block of free time. 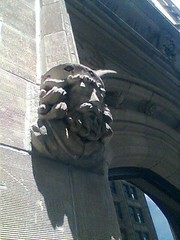 I hopped a shuttle bus to the hotels and went for a walk. 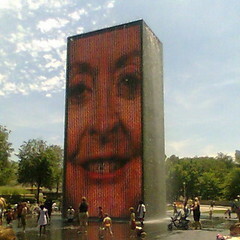 Y’know, I lived in Chicago for the first half of the year 2000, and this whole Millennium Park business hadn’t even been built yet. I have no idea what that building is. 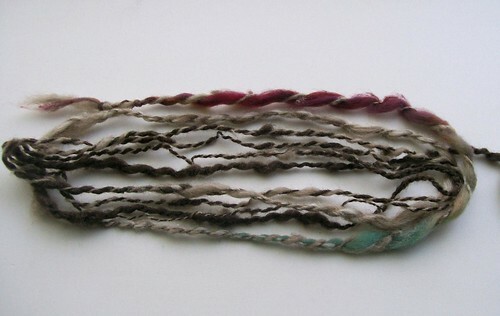 I was really surprised by how small the selection of Lorna’s Laces was, since it’s a local dyer. 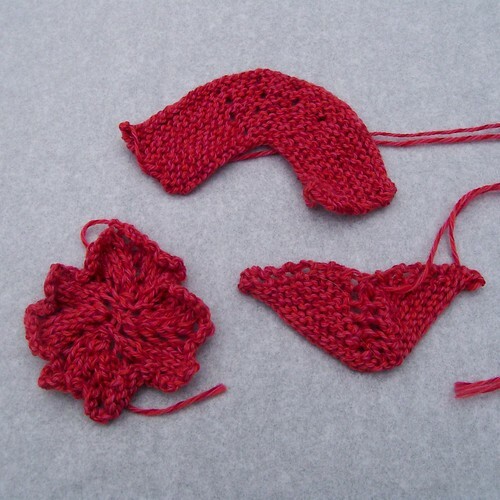 I would have loved to pick up some Helen’s Lace, but I learned that Loopy recently stopped carrying it. Bummer. I was also a little surprised that the prices on Shepherd Sock were higher than the prices at my LYS, which are already a little higher than MSRP. And that’s before Chicago’s crazy taxes. True story: when I rented my Chicago apartment over a quick trip as an about-to-graduate college senior, I had no idea that I was a block east of Boystown. Then, the day I moved in, my dad I drove past these pylons. I also popped into my favorite bookstore for a copy of The Graveyard Book, which I wanted to have signed, and my old hardware store, where I finally found some of those vinyl caps that (when combined with stretchy cord) make fantastic dpn holders. Finally, I headed up to Arcadia Knitting, where I was seriously disappointed (again!) in the tiny selection of Lorna’s Laces. 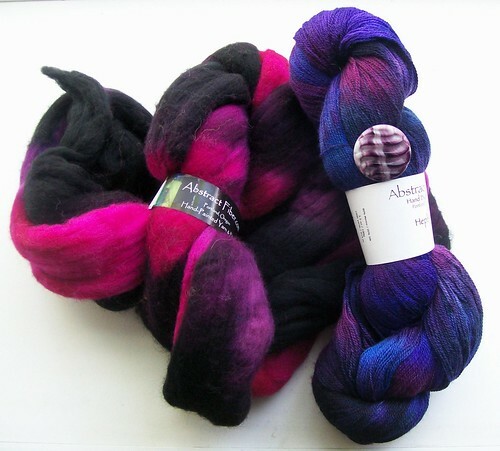 I debated buying some LL Angel in the “Go Bears!” colorway, but I don’t see myself knitting angora anytime soon. Alas, I left empty-handed. 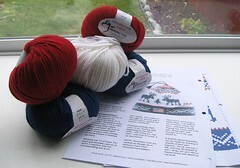 A while back, the Loopy Ewe started selling this lovely sock yarn from Germany. It had intense colors and fantastic yardage, and everybody wanted it. “Sneak-ups” disappeared in minutes, people stayed up all night refreshing their browser screens in hopes of catching a few skeins, and there was much drama. 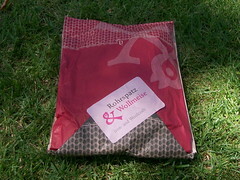 Updates to the dyer’s personal online shop also went quickly, despite the higher shipping costs. The other I held on to for quite a while, searching for the perfect pattern. It is now slated to become the Entomology shawl, and I was feeling a bit sad as I strung the beads, wishing I had a bit more of the elusive Wollmeise. And then it happened. I caught two updates in a row of the online German shop. The first package arrived yesterday. Inside a padded white airmail envelope was a cute brown/mauve bag. 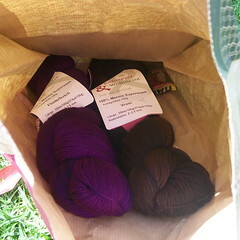 Inside the brown bag, two skeins of yarn and a packet of Gummi Bears. The yarn is lovely. Both skeins are 100% Superwash Merino. Fliederbusch, on the left, is a deep purple that my camera has great difficulty capturing. 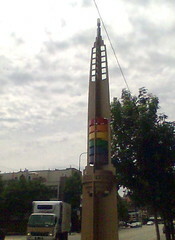 Vroni, on the right, is a blend of black and brown. I have a few more skeins coming in the next week or so. And then the hunt for the perfect pattern begins once more. 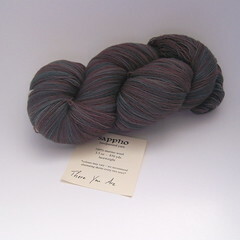 Sanguine Gryphon Sappho I in “There You Are”, a lovely muted blend of blues and purples. That picture does not do it justice. 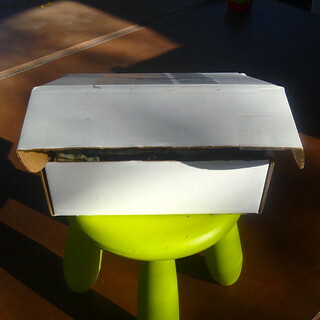 I attempted to make a DIY Macro Studio out of a cardboard box and waxed paper, but I am having difficulty with the lighting source. Direct sunlight is clearly not bright enough. Out from under the waxed paper, the direct sun is too bright. I am still working on it. I bought that skein from Gryphon’s online shop, along with a copy of the pattern for Call of the Sirens, and two bars of soap. Gryphon usually includes a little sample bit of soap in her packages. 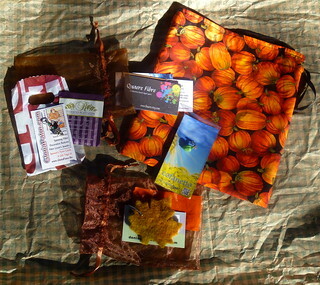 My first order from her (the yarn for the Chicago Illusion blanket) came with a bit of clove-scented soap. I am building up a bit of a laceweight yarn stash to complement my sock yarn stash. I’m looking forward to doing a bit of vacation stash enhancement next weekend, when I’m in Chicago for the ALA Conference. I’m planning to be at Loopy Yarns around 12 Noon on Sunday (7/12) and Arcadia Knitting around 12 Noon on Tuesday (7/14). Going to be there, too? Drop me a comment! I hear there’s a Knit Night at Loopy Yarns on Friday evenings; I won’t be in town early enough to take part in that.